Inspired by all my mom's thrifted finds, Aaron and I stopped at a few yardsales this weekend. 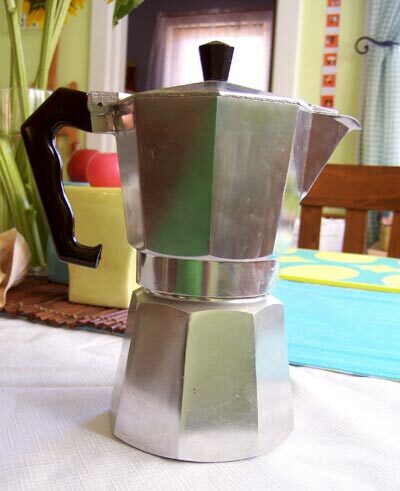 My big win was this Zanzibar Italian expresso maker. It was marked $5 but since the lady had no idea how to use it she gave it to me for 25¢. It is a "Vesuvio" brewer and I found out online how to use it. what a wonderful find! I've been wanting one of these for ages. We've got one of them - the best coffee ever ! I have one of those as well. I brought it back with me from my stay in Spain, so in my family it's called a 'cafetera'. Now I stop at every little coffee roaster to buy the house speciality, which makes for good coffee variety on Sunday mornings. And a fun link to follow Latte Art Barista Championship. I am soooooo jealous. I have been wanting one forever! What a deal! These are great - I have had mine for years. Make the best espresso EVER. Enjoy your coffee! I have a personal-sized one of those (I got it at World Market), and I use it all the time! I've drawn this in drawing class. You will love using it. My Italian husband inherited his from his grandfather and it works so much better than the new one he received a few years ago. when i lived in spain the lady we boarded with made us coffee w this every day. I've been coveting my mom's forever. Someday, she will break. And I shall have it! bwahaha.